Imperial College held a ‘topping out’ event recently, to celebrate the near completion of the 35 storey residential tower at its White City campus, in Wood Lane London W12. A local campaign which started back in 2012, in an attempt to prevent the onset of a series of very tall buildings in this part of London, clearly failed in its aims. 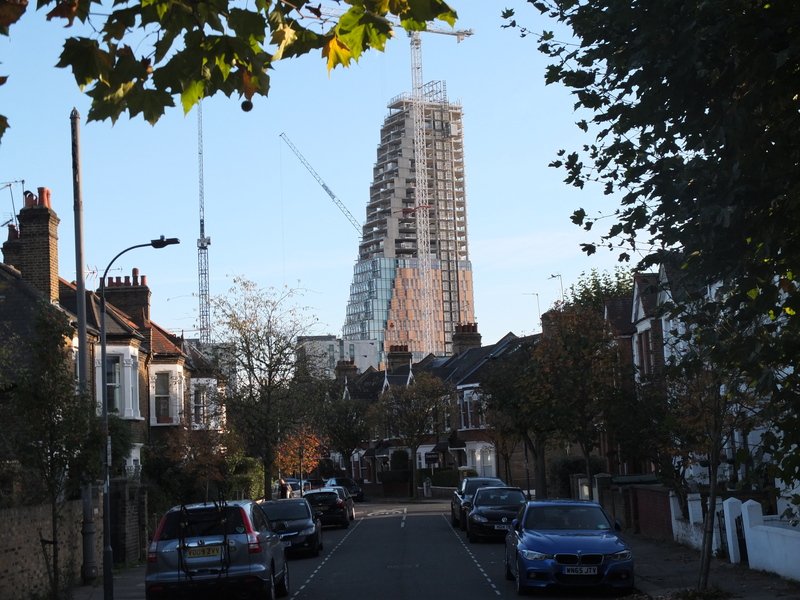 The western skyline of North Kensington and Shepherds Bush will within a few years join much of the rest of inner London – with a vista of a series of high density residential towers. The decision by Hammersmith & Fulham Council in 2013 to approve Imperial’s planning application was followed by other development proposals at Phase 2 of the Westfield Centre, and at the adjacent St James scheme in Wood Lane. The architectural merits of the Imperial development, as built to date, are a matter of personal taste. So far there are few who see the cluttered mix of buildings in Wood Lane as examples of the highest standards of design. Compared with what is being built by Oxford University, in the city centre, they do no credit to the College as a leading global academic institution. Whether the residential tower will prove a financial ‘folly’ depends very much on the state of the London housing market over the next few years. The lower third of the building was originally destined to house Imperial ‘key workers’ (junior academics and medical staff working for Imperial Heathcare Trust). It is now being said that the College will retain the upper two thirds also for its own staff, rather than sell or rent these apartments on the private market. Demand for apartments in this part of London, directly overlooking the pollution hotspot of the Westway elevated roundabout, is hard to forecast at a time when London house prices have stalled.. Other residential developments nearby, at the former BBC TV Centre and at the St James scheme dubbed White City Living, may prove a more attractive option for a reduced clientele of overseas buyers. At the more affordable end of the market, a series of residential towers of ‘build to rent’ flats have been granted planning approval along Scrubs Lane, by the Old Oak and Park Royal Development Corporation (OPDC). Looking like a throwback to the 1960s these tower blocks (around 20 storeys high) have been hustled through the planning system despite objections from adjoining London Boroughs, in an effort to demonstrate that proposals for 24,000 new homes at Old Oak are a viable reality. 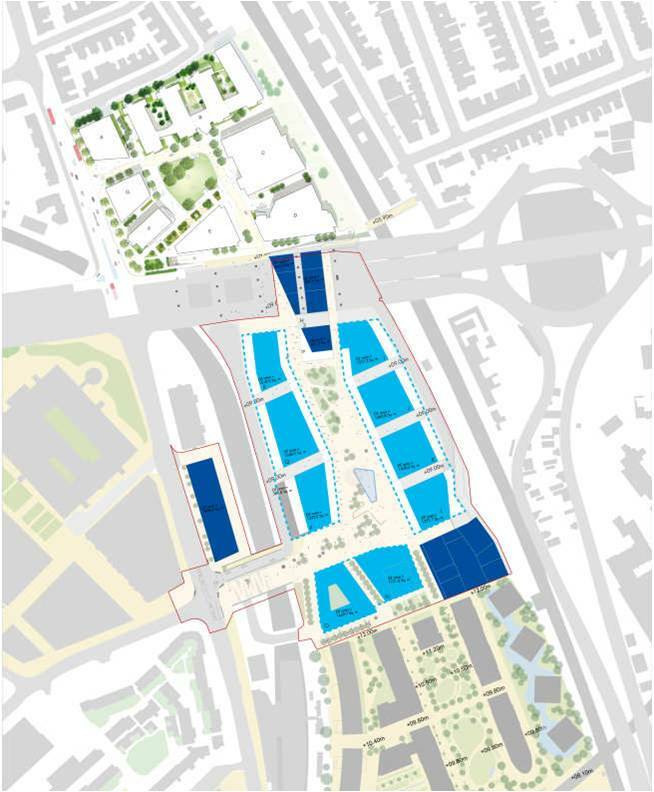 Imperial College is consulting on plans for its final two buildings adjacent to the tower on its northern site at White City, along with outline proposals for the 11.5 acre site that it purchased in 2015 south of the Westway. 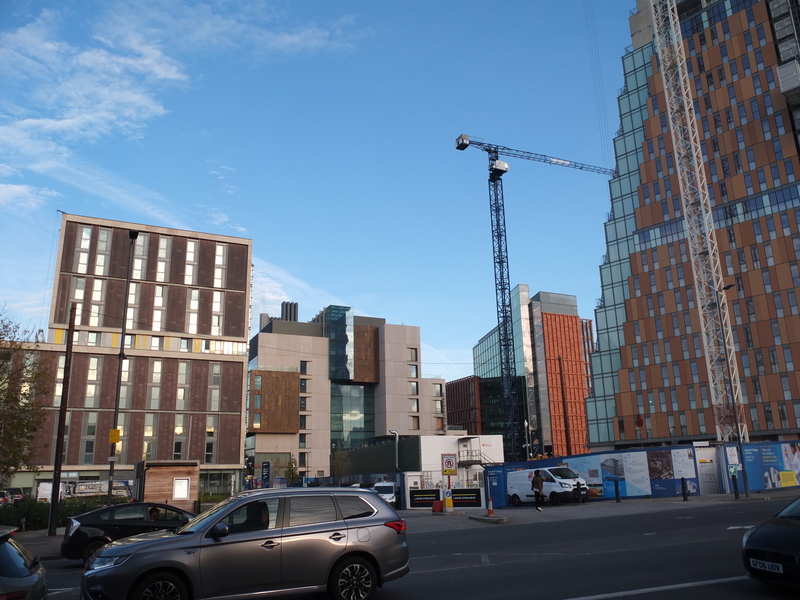 The two buildings fronting onto Wood Lane will be a few storeys higher than when first approved in 2013, further overshadowing the ‘public square’ at the centre of the development. The plans remain at a fairly early stage. An application for outline approval, setting parameters on building mass and height, will be submitted once this latest consultation has concluded. This development, intended to be phased over a longish period, will include research and business buildings of 6-13 storeys, and two further residential buildings of 17 and 32 storeys. The 32 storey tower is sited at the southern end of the site, close to Westfield and the Central Line, which makes sense. This means that the original ‘vision’ of two tall towers creating a ‘gateway to London‘ for drivers approaching Westway, will never be realised (thankfully in our view). First proposed by Dutch urban planner Rem Koolhaas in a 2004 masterplan competition for White City, the ‘gateway’ concept was always an idea that appealed to planning officers rather than to residents destined to live in the shadow of such towers. The ‘gateway’ term, along with ‘landmark building’ continues to be used regularly in planning statements submitted by developers across London, in an effort to justify their commercial aspirations for building tall. London’s second love affair with tall buildings shows little sign of ending soon, despite noises from the Mayor of London that future growth will be ‘good growth’. The first love affair ended not that well, with the collapse of Ronan Point in 1968. Lessons learned by those who had actual experience of bringing up families in tower blocks were later lost, and will take time to be re-learned. Imperial’s 35 story tower will have its place in the history of London’s urban design, as the first example of a building of this height in a sector of London which had previously been spared anything on this scale. Time will tell how this place in history will be viewed.